The new Absorptometer "C" Data Acquisition System determines oil absorption in compliance with ASTM D 2414 as well as ASTM D 3493 including new procedures B and C.
The measuring principle is the same as with the previous models, but in contrast to these, the instrument and burette do no longer stop automatically, enabling evaluation acc. to the new procedures B and C of ASTM D 2414. 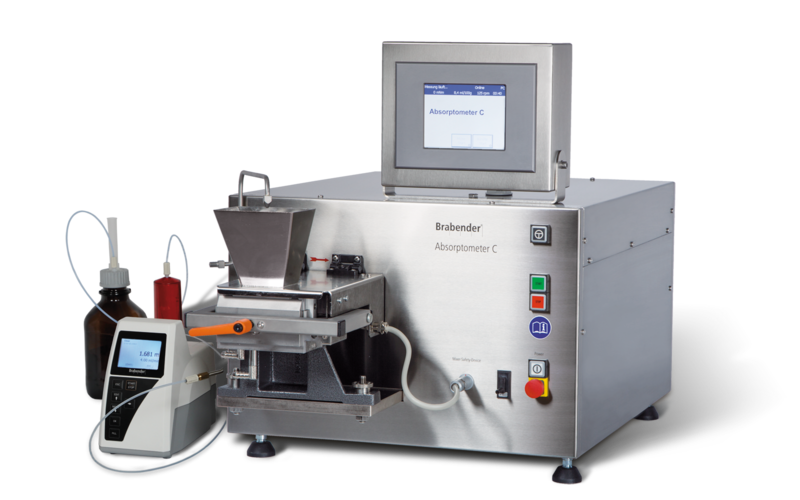 The Brabender Absorptometer “C” is a tabletop instrument with a torque measurement system (dynamometer), which is used for the precise and reproducible determination of the oil absorption number (OAN) of powdery materials. The test method is based on the changes of the consistency of powdery materials during oil absorption. How can such consistency changes be recorded and visualized? The Absorptometer “C” consists of two main parts: a drive unit with a torque measurement system and an attached mixer with special blades. The torque is measured and recorded throughout a special mixing process: the oil is gradually added by an automated buret into the mixer. The free flowing, powdery material absorbs the liquid and starts agglomerating. During this transition, more and more torque is needed for the mixing and eventually a torque peak appears on the time-torque curve. The OAN itself is given in accordance with the standards and common practice in ml (of the absorbed oil) / 100 g (of sample material). One PC can handle up to 4 instruments with 2 or more interchangeable mixers each. All test parameters required by ASTM D 2414 are preset as default values, though can be changed to meet individual requirements. Fully automated buret controlled from the PC incl. sequencer regulated titration rate for quick titration at the beginning and reduced rates during the significant test phase. Convenient continuous operation at low cost: one basic instrument can be run with several interchangeable mixers due to mixer specific determination of the TLS (= torque limit switch) values and all other important data. Choice between local and remote operation for economic and clean test procedure. Automatic saving of tests in remote operation. Lists with different test configurations can be defined and saved at the PC in local mode andthen be worked off in remote operation from the Absorptometer “C” control panel. Creation of test patterns for running several tests with one and the same sample: create the test pattern at the PC (local mode), then work off all tests from this pattern at the Absorptometer “C” (remote operation). Normalization trends show mixer wear. System normalization as per ASTM with standard reference carbon blacks, including the possibility of normalization with other than standard carbon blacks (e.g. for laboratories working with their own reference carbon blacks). Evaluation by fitting of 3rd order polynomial on the significant part of the torque curve for optimum eproducibility. Evaluation includes the procedures A (endpoint at TLS), B (endpoint at 70 % of maximum torque) and also C (endpoint at fixed but reduced torque level).